Kevin: Congratulations, kids, we have our first unequivocally good episode of Deep Space Nine since Emisarry. Dabo! This is D.C. Fontana's only contribution to DS9 and her last to Star Trek generally. It's not a bad note to go out on. We managed to combine to major things we like to do here on Star Trek, which is explore a science fiction concept and credibly develop characters. 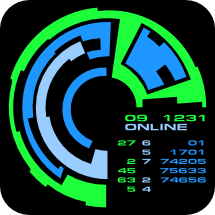 We even managed to work both those things into what could have been a boring alien of the week problem. Let's start with the science fiction. It's good. We get a range of exploration from the medical to the philosophical about the nature of the host and the symbiont and the resulting entity. There's credible back and forth with the competing analogies. I also liked that they worked in an exploration Sisko's friendship with Curzon and his new one with Jadzia. Matthew: It's funny how a string of lackluster episodes can get you into a funk. As I was watching this, I was thinking to myself: Wow! This is shockingly well-paced, exciting, and interesting! The tightly paced abduction scenes were quite good. Things settled into a talker frame of mind as the episode wore on, but I was never bored. I too liked the fact that the problem at hand lent itself to exploring the Sisko/Dax relationship, and I loved the line about the ring slipping right off her finger. Kevin: As far as trial episodes go, this was a fun one, though a lot of that is the acting. I had no eye-twitch moments of absurd legal procedure. I also liked they brought in a Trill to discuss how Trill work. Nothing like precedent. And it's a good ethical question that transcends the needs of this one episode. Is it worth letting the occasional symbiont get away with something in the name of not punishing an innocent subsequent host. Matthew: Yeah, nothing perks up a show like a good trial. This trial seemed credible, given the extradition aspect of it. It afforded some little-used characters like Bashir the chance to shine a bit. I did find it odd that O'Brien was just sort of written out of the show, but it actually gave the other characters a chance to breathe. Odo was also used to good effect as an investigator. I kind of wish, given this episode's early position in the series, that some of the characters would have a bit more of a problem trying to prove her innocence. I liked, though, that Sisko was much more concerned with saving whatever remained of his friend than with truth, duty, probity, and so on. It's a refreshing change. Kevin: The political elements are not quite the heights of the Klingon episodes, but we get enough info to keep up without it bogging down the episode. The dramatic courtroom reveal was a little much, but enjoyable, and I liked Enina Tandro's speech about living with the memory of a legend. It was expository while still being personal. Matthew: Yeah, civil wars on Planet 42359 are usually the stuff of snoozers (See: Too Short A Season). But this focused much more on the sci-fi aspect of the host-symbiont relationship, and the emotional tenor of the affair/betrayal story. So the episode didn't suffer for this plot element. I found the whole "my husband the legend" thing a bit trite. It was too easy that he was in fact the villain. I also felt that the wife's obvious machinations were a bitt oo obvious a bit too early. Kevin: In terms of complaints, I would say like it's similar brethren, Measure of a Man, it did get a little talky. The investigation was a little pat, too, I suppose. Not a single historian has explored the death of this legendary general? Not even from the losing side looking to tear down an icon? That could have been fixed by acknowledging the accusation existed before, but Enina was the only one who could confirm it. A small complaint, but there it is. Overall, this is still a good, but possibly not great episode, and certainly a step in the right direction. Matthew: My main complaint was how inert the Dax character was for a good 30 minutes in the story. Her scenes with Sisko were really good, so I really wanted more of them, as opposed to just static reaction shots of Terry Farrell. Kevin: This is the strongest part of the episode and that's saying something. Anne Haney appeared in "The Survivors" and she killed as Els Renora. She was really imperious. Gregory Itzin was great, and he'll be back on DS9. And I can't say enough nice things about Finnoula Flannigan. She really commits to her parts. All three really sold the internal veracity of their characters. They took a good script and made a great episode. Matthew: I think Flanagan oversold the conflict in her first scene, which made her part in the resolution a tad too obvious. But I liked her generally. I agree on Itzin, he played the dogged son and prosecutor really well, and I actually kind of rooted for his earnestness and passion in the role. Anne Haney has a truly distinctive voice. You're right, she nailed the regal, officious, but still crusty arbitrator. It says a lot for her range. Kevin: The main cast was at least okay this time around. Bashir following Jadzia after she turned him down is seriously crossing into not-okay level of creepy. Farrell is still playing Dax as austere and she did okay, but it's not as fun as later Dax. I liked the conversation between Dax and Sisko about Curzon. Matthew: This episode rescued the Bashir character a bit for me. I agree on the stalker-ish behavior, but his courtroom testimony was well acted by Siddig. I actually kind of enjoyed his slightly snobbish air here. 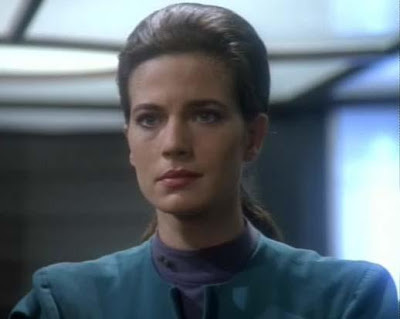 Terry Farrell left me cold in all but her Sisko scenes. This is as much the fault of the writing, though. I liked Auberjonois more here than in any previous episode. His scene with Shimerman, twisting his arm to use the bar (why is there no other conference room again?) was really good for his character. Kevin: Not a lot to say here. We couldn't find a big enough room other than Quark's? Really? I know we don't have the wardroom yet, but come one. Other than that, this is a bit of a bottle episode, except maybe for Enina Tandro's house, which was also pretty nice. Matthew: Totally a bottle episode, as you say. I will add, though, that this was mitigated by some nice close-up work on the part of the director and crew. Shots were rarely boring, and the courtroom drama was really well handled. Kevin: I did really like the shot of the Klaestron ship arcing over the station and getting pulled back in by the tractor beam. It was a nice shot, cleanly executed, and served the episode. Matthew: Both the ship and the Klaestron planet are well-used holdovers from past TNG shows, with the matte painting (original show: Angel One) getting at least its tenth use here. Either way, both looked nice. It was really one of the only visual effects highlights. Kevin: This is an enthusiastic 4 for me. I may like this more than Emissary. This is a big step in the right direction and I hope to see more of this soon. Of course, we're coming up on Move Along Home, so I won't hold my breath. Matthew: For me, this is a question of how grave a sin shutting up Dax is. So much of this episode was otherwise good, that it was consistently annoying for me to have that reaction shot cutting to a mute Dax. That, combined with the telegraphing of the solution, I think limits this to a 3 for me. But: A good solid 3 episode is not bad by any means, and given the recent spate of drab episodes, it's a real boost for the morale of this DS9 viewer. So our total is a 7. Err...did i miss something? In the beginning they say Keiko is going to Earth or whatever to celebrate her mother's 100th birthday. For real? Keiko could not be more than 30 years old - how old was her mother when she had her? 70? 65? I know medical care has improved in the 24th century but 85 year old mothers with 15 year old teenage daughters? Come on...Anyone else notice this? I hadn't noticed it. I did take the O'Briens to be about 40, so her mother would have been 60, which is just squeaking into the bounds of what medicine today can do. My guess is that there wasn't a lot of thought put into it, but I could be wrong. It is an interesting thing to say that lifespans have expanded to 130 or so, and that 60 may not even be considered advanced middle age by then. 60 is 60. You may not have the same ailments but you are not changed into the equivalent of a 30 year old. Your physique is still that of a 60 year old. As a woman you may be able to have babies at 60 due to advanced medicine but the quality of your eggs are not changed, they are still the eggs of a 60 or 70 year old. One could argue they used genetic engineering but that was one thing i thought they were not doing (or they were doing it but only before someone is born, not after). And while i buy that Miles may be in his 40s, I dont think Keiko is. She does not strike me as older than 35. I mean Bashit is what in his late 20s?